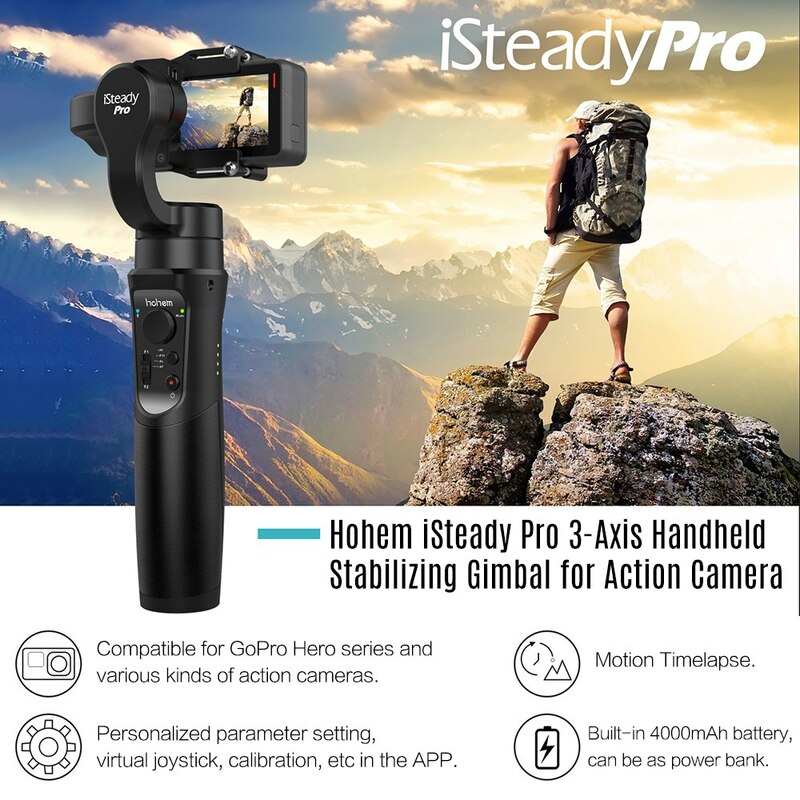 The iSteady Pro from Hohem is a gimbal – a stabilizing suspension – for action cams like GoPro, Yi and SJCAM. We have tested many of these cameras, and they all have in common that the image is usually shaky when you film out of your hand and walk around. 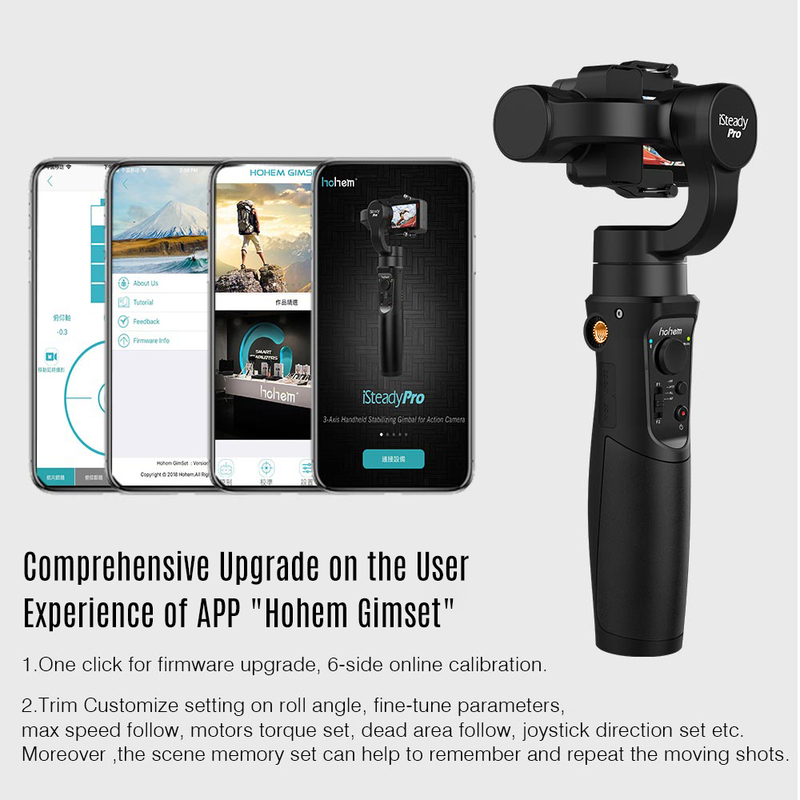 No problem if you use a gimbal. 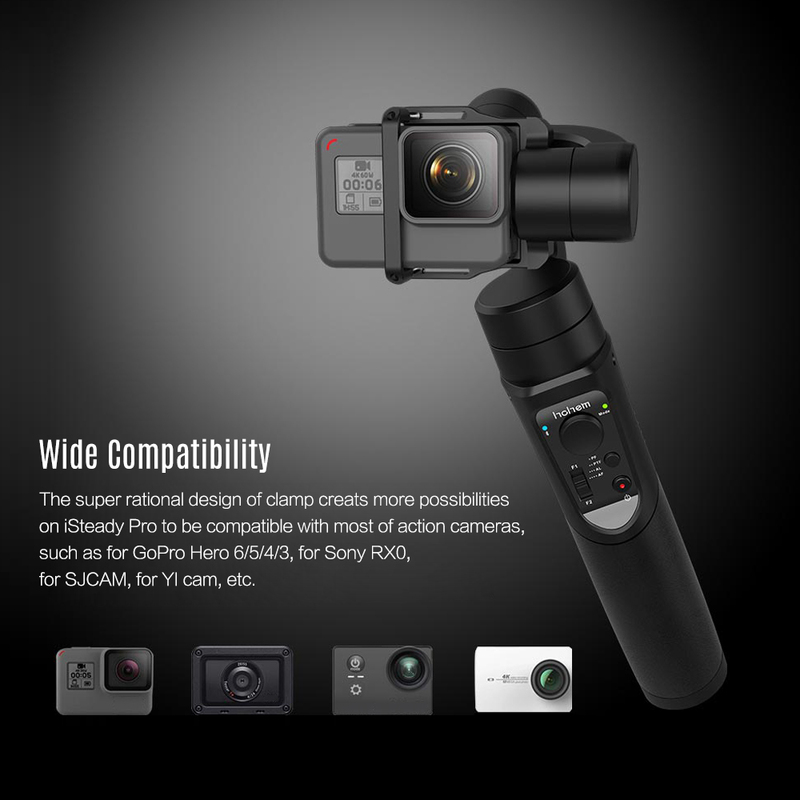 The appearance is more or less the same for almost all gimbals. 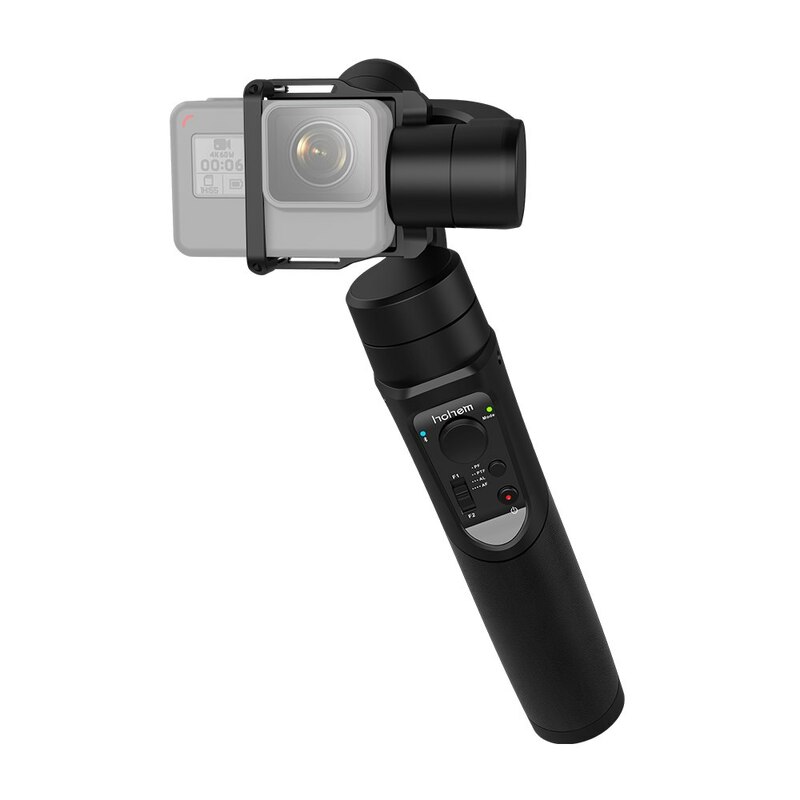 At the top of an ergonomically shaped handle with a few buttons is the movable gimbal itself. It rotates around a total of three axes and consists of several moving parts. Attached to it is a holder into which an action cam can be clamped in this case. Four LEDs on the side of the handle indicate the battery status. 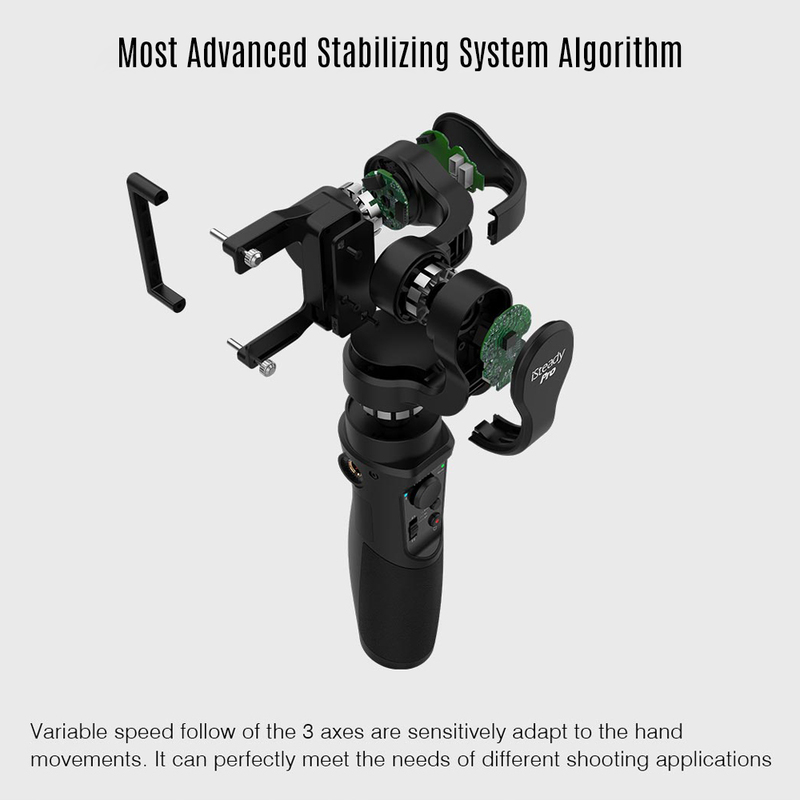 The buttons can be used to change the modes of the gimbal (more), to actively control the tilt of the camera or to activate the shutter release button of the camera when it is connected to the gimbal via Bluetooth. A standard thread is located under the handle. A stand, which can be screwed on there, is included in the box. 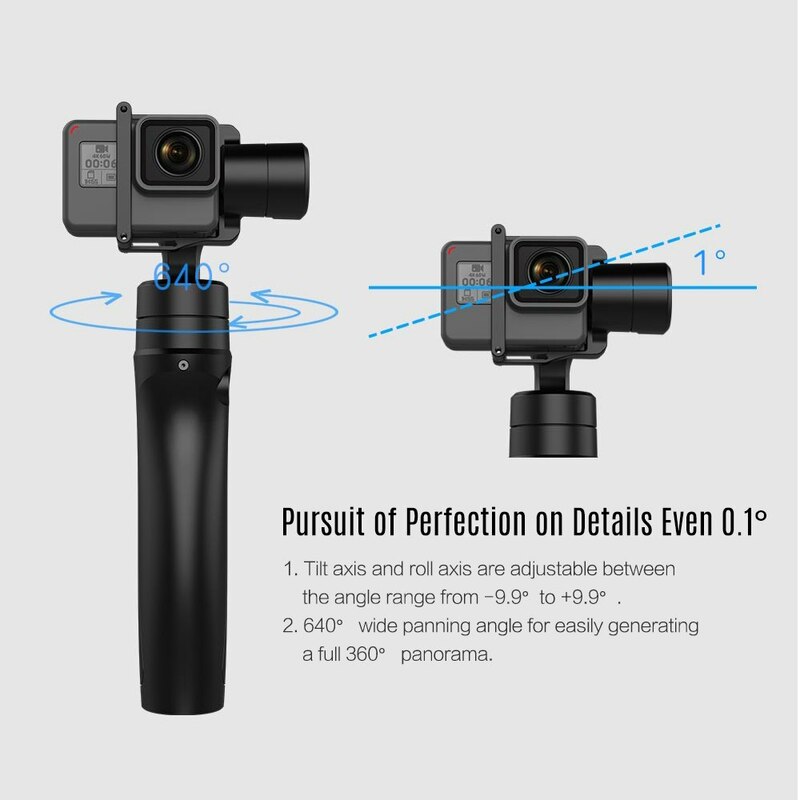 Another thread, which not every gimbal has, is at the upper end on the left side. You won’t really need it, but at least it offers another way to fix it. What modes and settings are there? 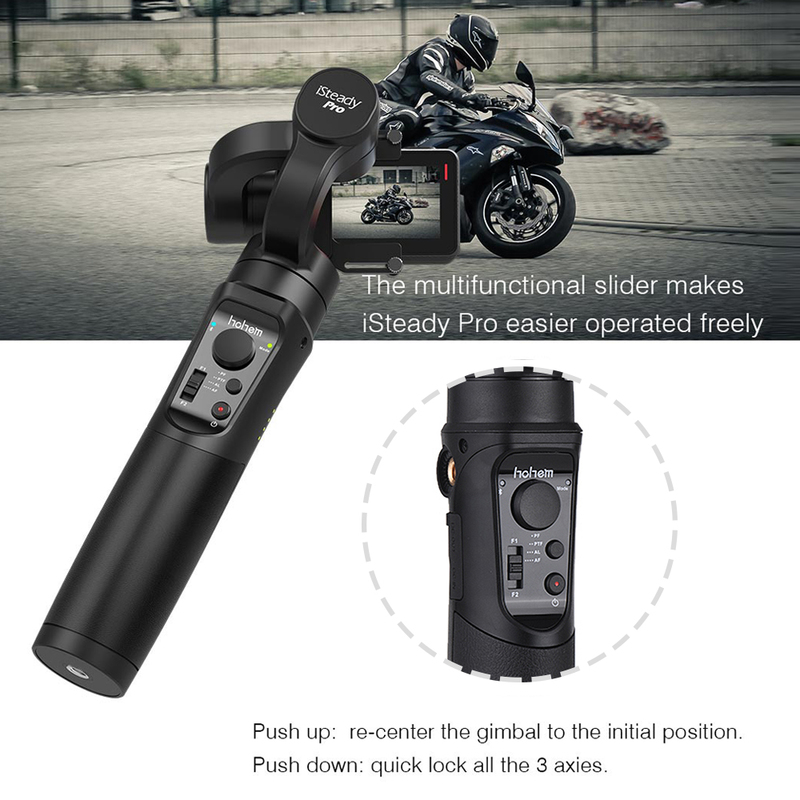 The iSteady Pro has the four usual settings for filming. In “Pan Following” the camera remains horizontal, but slowly follows the rotation around the longitudinal axis (so if you turn in a circle). 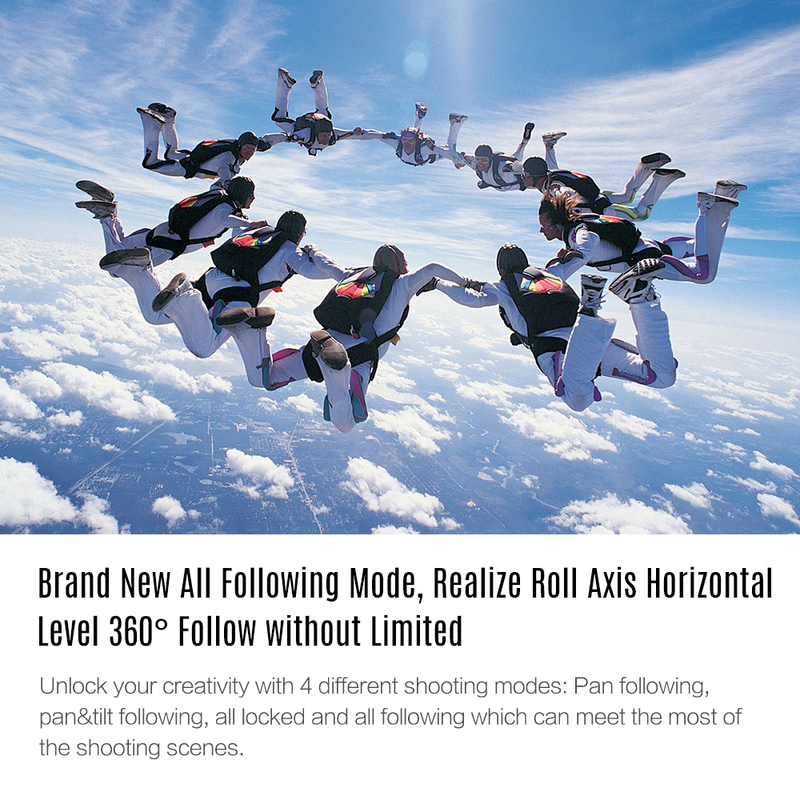 With “Pan & Tilt Following”, the camera also tilts accordingly when the gimbal is tilted forwards or backwards. “All Following” consequently means that the camera follows every movement, including a lateral inclination of the gimbal. In “All locked” mode, all three axes are locked. No matter in which direction you tilt or move the handle, the camera will film in the same direction. All this is of course under the condition that no hasty movements are made. If you wave the gimbal around wildly like a flag, you won’t get any good shots but in case of doubt just break the engine. But: fast walking up to slow running, that’s still possible. 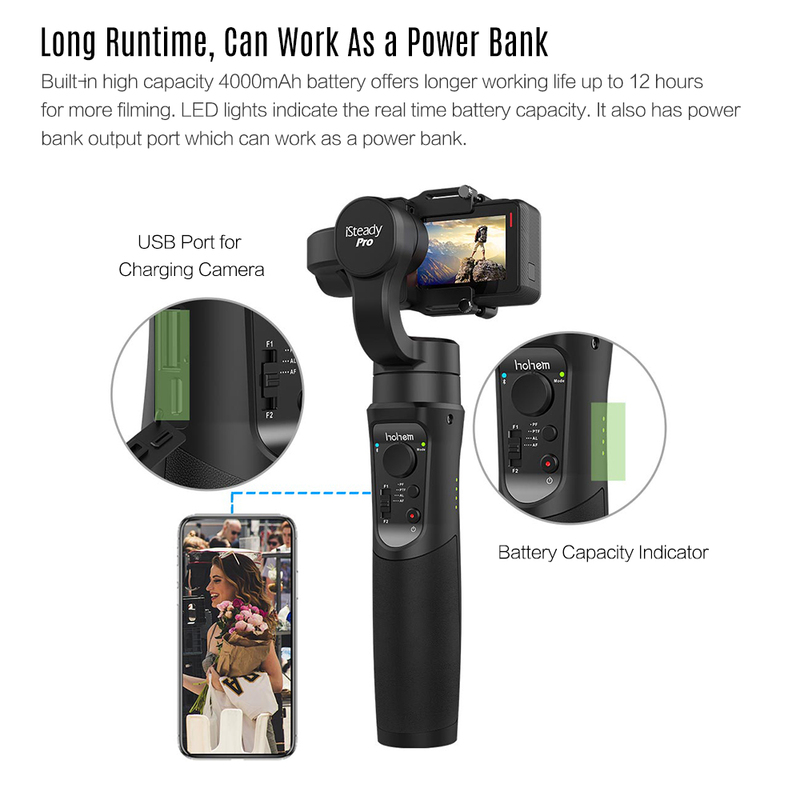 Which action cams can I use with it? The manufacturer himself mainly states GoPro, and also shows a camera on most pictures. Nevertheless, all cameras from other manufacturers can be used as usual. So we took some pictures with the SJ8 Pro, and also the YI 4K can be clamped. The only difference is that the cameras are used differently, the motor must sometimes be on the left, sometimes on the right. But this is even explained in the manual. The camera must not be too big, otherwise it simply does not fit into the holder. Too much weight is also a problem because it overloads the motor. Most Action Cams weigh less than 100 g and are no problem. 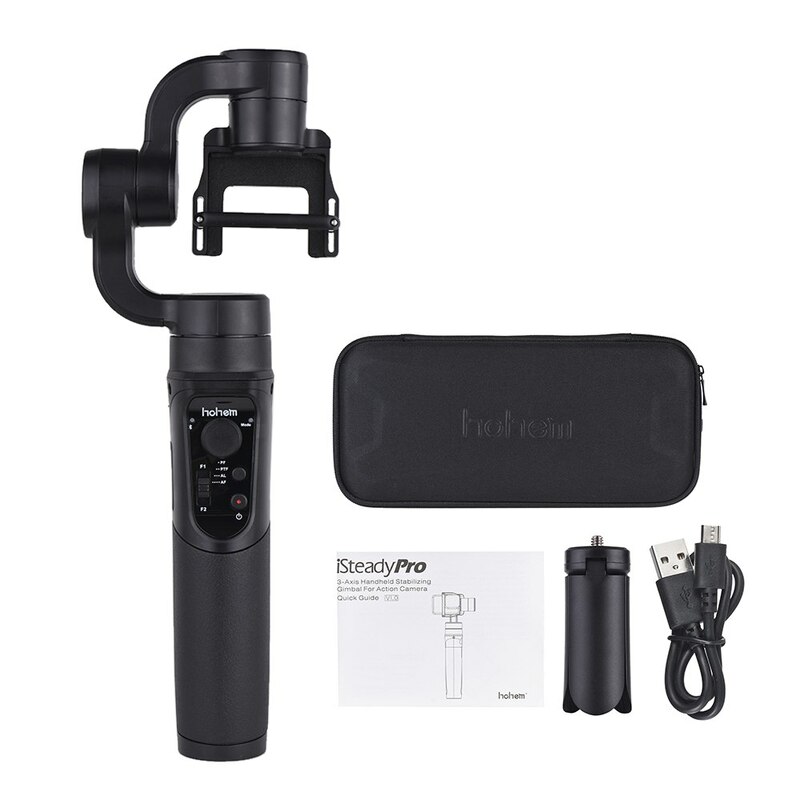 $120 - $150 is also a good price for an actioncam gimbal and it works great.